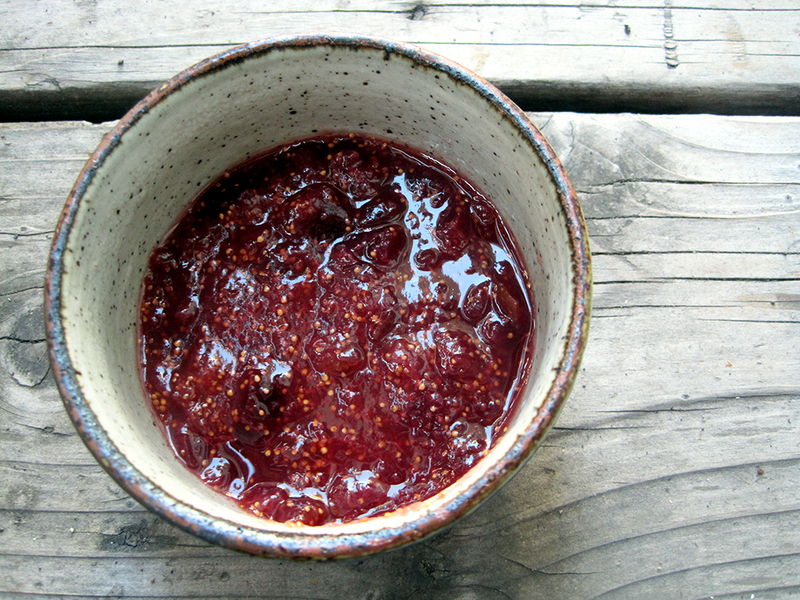 I made this jam last fall the same time I made this fig-balsamic jam, and I finally got around to typing out the recipe. This jam is sweeter and chunkier than the balsamic version, and best suited to slathering on freshly baked bread (at least in my humble opinion!) I love the depth of flavor that the port adds to the figs, and you'll definitely want to use a high quality port here since the flavor does come through. The rosemary flavor isn't as strong, but I think it adds a little extra kick. Google tells me that fig season comes twice a year: in early summer and in late summer through the fall. So, I guess that means you can't make this jam right now. But, I had to share it because we recently opened a jar and I was reminded how very delicious it is! (This is definitely the best part of making homemade preserves - eating out-of-season fruit that actually tastes amazing!) Next time you see fresh figs at the market, definitely snap them up and try out this slightly boozy, super figgy jam! In a large pot, toss together the chopped figs and the sugar. Let stand, stirring occasionally, for 15 minutes. Add the lemon juice, pork, rosemary, and salt. Bring to a boil, stirring until the sugar is completely dissolved. Reduce heat, and simmer, stirring often, about 20 minutes. The fruit should be soft and the liquid should pass the gel test. Remove the rosemary sprig, and immediately transfer to sterilized jars. Process in a boiling water bath for 10 minutes. Let cool completely and check that lids have popped before storing the jam. I love the combination of spinach and artichoke in a creamy dip, and it's also a perfect pairing as a pasta filling! When I saw a fantastic recipe for spinach and artichoke stuffed shells at Barbara Bakes, I knew I had to try them. But, strangely enough, my grocery store didn't have any shells! Don't know who dropped the ball there, but since I had all the other ingredients in my basket, I figured the dish would work just as well as a lasagna. In fact, the assembly is even easier, since you don't have to stuff individual shells. 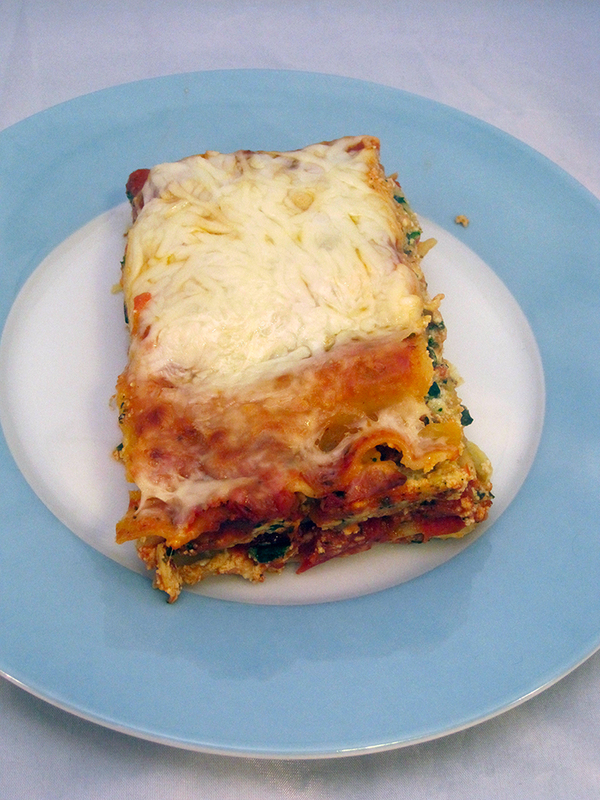 This makes a seriously hefty lasagna - the filling is delicious, but there's a lot of it and thus the lasagna ends up with lots of layers. If you want a somewhat lighter dish, I'd suggest making just half the filling and using less noodles. 2. Mix together the ricotta, 1-1/2 cups of the mozzarella, the Parmesan, eggs, spinach, artichoke hearts, Italian herbs, and red pepper flakes. Season generously with salt and pepper. Make sure everything is well combined. 3. Set out a 9x13 pan. Pour in a little marinara sauce and spread around the bottom. Place a layer of noodles over the sauce (I found that 3-1/2 of the Trader Joe's lasagna noodles fit well, but your mileage may vary depending on the noodles you use.) Scoop on about a quarter of the cheese mixture and pat down with a spoon or wet fingers into a relatively even layer. Scatter over about a quarter of the diced tomatoes, and drizzle on some tomato sauce. Spread around with the back of a spoon until everything is relatively evenly distributed. 4. Repeat until you have four layers of filling and five layers of noodles. Pour over the remaining sauce and spread to coat the top layer of noodles. Sprinkle with the remaining 1-1/2 cups mozzarella cheese. 5. Get a large piece of aluminum foil (big enough to cover the pan. Spray it with oil, and then cover the lasagna, oil side down. Bake 40 minutes. Remove the foil, and bake another 10 minutes, until the cheese is browned and the lasagna is bubbling. Let sit at least 10 minutes before serving. When I was younger, I hated bell peppers, and therefore I hated stuffed peppers. 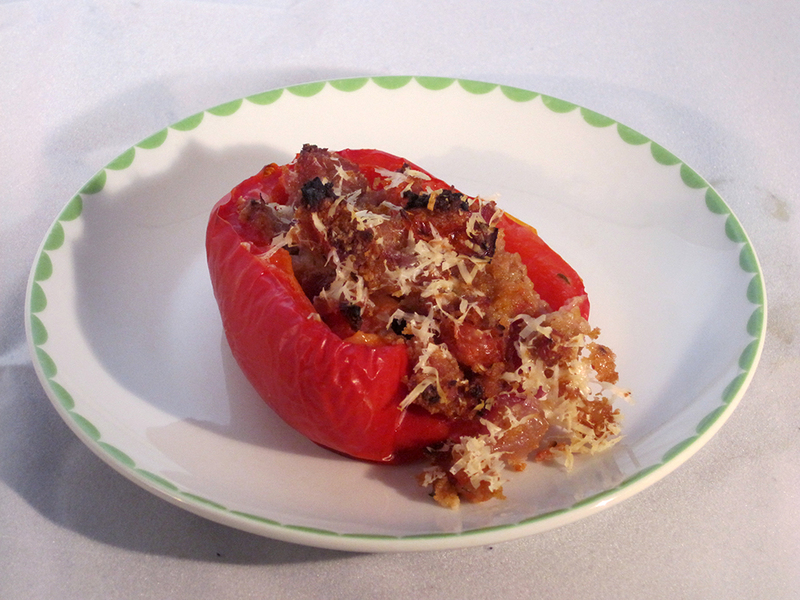 I'm glad my taste buds have expanded their range, because these stuffed peppers are fantastic! The peppers are blanched before baking to make sure they get tender. Then they're stuffed with a flavorful combination of ground pork, garlic, and rosemary. Simple, and so tasty! These make a great dinner with a green salad, and the leftovers keep well for lunch the next day. 1. Preheat the oven to 400 degrees and line a large rimmed baking sheet with foil. Lightly grease the foil. 2. Heat a few glugs of oil in a nonstick skillet over medium heat. Add the onion and stir for a few minutes until the onion is softened but not brown. Add the garlic and rosemary. Cook for another minute or so, stirring.Add the tomatoes, and cook until the tomatoes have collapsed into the sauce. Season with salt and pepper, and then stir in the pork and breadcrumbs. Cook for 3-4 minutes, until the pork is starting to cook but isn't fully cooked. Remove from the heat. 3. Bring a large pot of water to a boil. Cut the peppers in half lengthwise and remove the seeds. Lower the pepper halves into the boiling water and cook 6-8 minutes, until slightly limp. Remove with a slotted spoon, and place skin-side-down on the baking sheet. 4. Divide the pork mixture among the peppers, and drizzle with a bit of olive oil. Sprinkle with Parmesan. Bake 35 minutes, until sizzling. What do you do when you end up with too many beets in your CSA? Make chocolate cake, of course! This recipe from Nigel Slater has been on my "to bake" list for a while, and since the beets have been coming in a steady stream all winter, I really had no excuse. I'll warn you up front that this cake involves a lot of work: there's cooking the beets, pureeing the beets, melting the chocolate in a double boiler, whipping the egg whites, sifting the cocoa powder and flour. Whew! This cake definitely creates a lot of dishes. That said, if you've got an afternoon to spare, the final product is both beautiful and delicious. The cake is pink going into the oven, but it comes out a lovely mahogany color. It's super moist, and the beets lend a subtle earthy flavor. 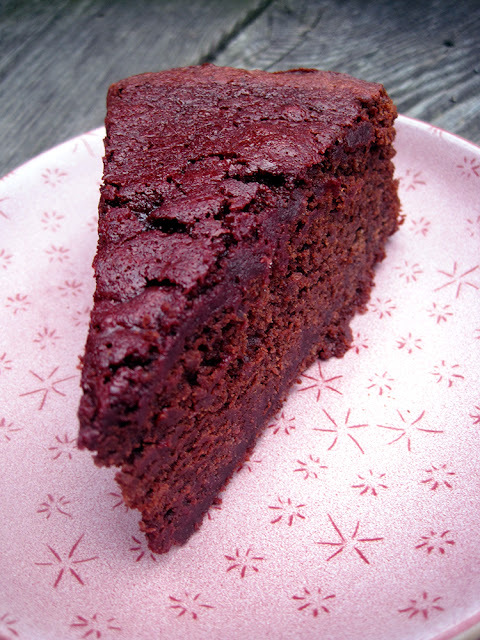 The cake makes a great dessert, and the beets make me feel it's a semi-legitimate choice for breakfast - it's definitely fantastic alongside a cup of coffee. 1. Grease a 9-inch springform pan. Preheat the oven to 350 degrees. 2. Bring a large pot of water to a boil, and cook the beets (whole and unpeeled), until tender - about 30 to 40 minutes. Drain, let cool under running water, and then slip off the skins. Slice off the stem and root, and then puree until very smooth. Set aside. 3. Set up a double boiler, and place the chocolate in the top over simmering water. Stir occasionally. When the chocolate looks almost melted, add the coffee and stir to combine. Add the butter, and stir to combine. Let the butter soften, stirring occasionally. When the butter is almost all melted remove from the heat and allow the butter to continue to melt from the heat of the chocolate. Stir to combine, and then let cool slightly. 4. Place the yolks in a large bowl and stir to break them up. Place the whites in a separate bowl. 5. Add the chocolate-butter mixture to the egg yolks and stir quickly to combine. Fold in the pureed beets. 7. Scrape the batter into the prepared pan. Place in the oven, and immediately decrease the temperature to 325 degrees. Bake 45-50 minutes, until a tester comes out slightly moist. Set aside to cool, and then remove from pan. Bring your favorite chocolate dessert to Roxana’s Home Baking#ChocolateParty and win amazing prizes from OXO, Calphalon, Keurig, Imperial Sugar, Honey Ridge Farms and Land O Lakes® Butter! I made these little brownies a long time ago, and they were so delicious. They're the first thing I tried from the new Bouchon Bakery cookbook, and I was so happy with the results. The little brownies were so moist and chocolate-y - almost like fudge. 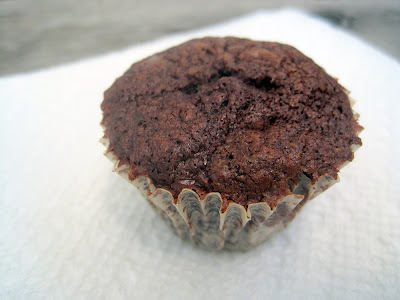 I actually do have a bouchon pan, but I ended up making this recipe in a mini-muffin pan just because I wanted smaller treats for a party. These are really rich, so the tiny size worked well. The only change I'd make next time is to get some Dutch process cocoa powder...although these tasted amazing, they weren't as dark in color as the real deal. 1. Place half the butter in a medium bowl. Melt the remaining butter, and then stir the melted butter into the bowl - some unmelted bits are okay. 2. In a separate bowl, whisk together the flour, cocoa powder, and salt. 3. In the bowl of a stand mixer fitted with the whisk attachment, combine the eggs, sugar, and vanilla. Whisk on medium-low speed until combined. Add the butter and flour mixtures in alternating additions (flour-butter-flour-butter-flour). Mix well to combine. 4. Fold in the chocolate chips. Set aside at cool room temperature for ftwo hours. 5. Preheat the oven to 350 degrees. Line mini muffin molds with papers. Fill each paper almost all the way with brownie batter. 6. Bake about 12-15 minutes, until a tester comes out with a few moist crumbs. 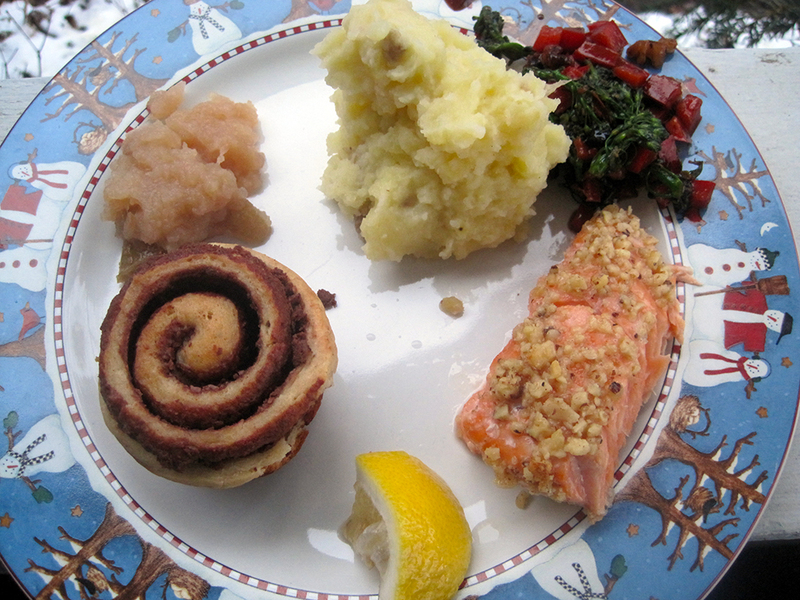 We made this recipe of my grandma's for Christmas dinner this year, and it was so delicious. We usually make a turkey, which is delicious but can sort of take over the day in terms of preparation time. 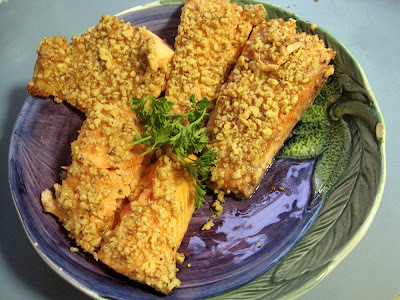 The salmon felt just as much a special-occasion dish, but was super easy to prepare. You can use any nut you like here, although the walnuts were very delicious. I wasn't so sure about using honey with salmon, but the sweetness and earthy flavor was really tasty, and combined well with the nuts too. Definitely don't skip the squeeze of lemon - this dish would be too rich without a little acid to brighten it up. 1. Preheat the oven to 350 degrees and oil a baking sheet. 2. Arranged the salmon fillets skin-side-down. Season the salmon fillets generously with salt and pepper. Drizzle each piece of salmon generously with honey, and use your fingers to smooth the salmon into as even a layer as possible. Dip the honeyed side of the salmon into the walnuts, making sure to get a good coating. Place the salmon on the baking sheet, skin-side-down. 3. Bake the salmon until cooked through, about 12 minutes - pay close attention, as the timing will depend on the size of your fillets. 4. Serve with lemon wedges for squeezing over top. A delicious Christmas dinner: walnut-honey salmon, broccolini with walnuts and sweet soy sauce, buttery mashed potatoes, applesauce, and Nutella swirl buns. I was recently lucky enough to win a copy of Salty Snacks from Stephanie O'Dea - thank you! I made these crackers from my new cookbook for a recipe exchange at my church, and they were a big hit. 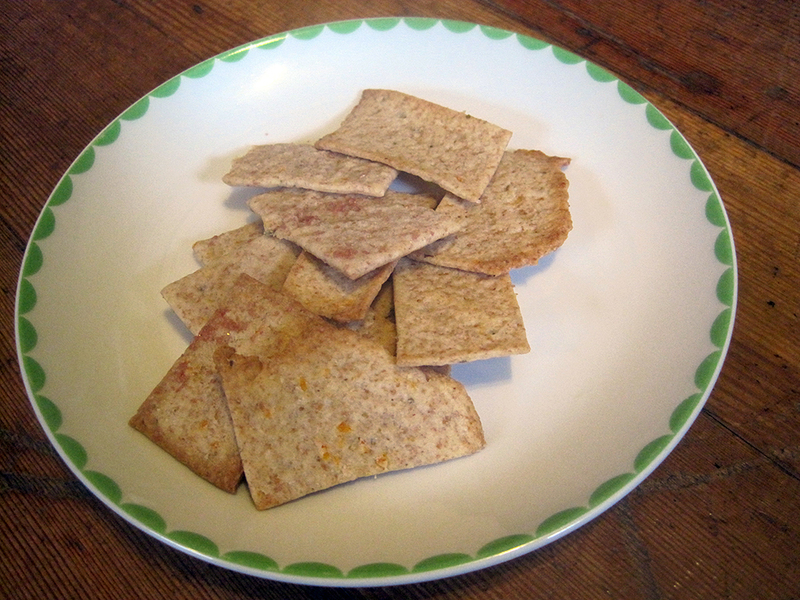 They look and taste very similar to Wheat Thins, and they're a lot of fun to make! These will definitely be much easier if you have a pasta roller - theoretically you can roll these out with a rolling pin, but I have a feeling it would be pretty annoying. As it is, the dough looks too wet to be rolled with a pasta roller, but I found it actually worked really well and with minimal mess. My only complaint about these little crackers was that I didn't think the flavors were as strong as they could have been - next time, I would probably add half as much again of both the fennel and the orange zest. It could also be fun to change them up with different spices and/or types of zest. 1. Combine the milk and butter in a small saucepan and warm over medium-low heat until the butter is melted. Let cool to room temperature. 2. Whisk together the flours, orange zest, fennel, and kosher salt in a medium bowl. 3. Add the egg to the milk-butter mixture, and whisk to combine. Pour the wet mixture into the flour mixture. Stir until a cohesive dough forms, adding a bit more flour. The dough will be fairly moist, but will hold together when you pinch it with your fingers. Knead the dough briefly to make sure everything is well incorporated. 4. Preheat the oven to 350 degrees and line two baking sheets with foil or parchment (no need to grease). 5. Divide the dough into four or five portions. Working with one piece at a time, roll through a pasta machine until about 1/16-inch thick (on my Kitchen Aid pasta attachment, I used setting #3). Transfer to the cookie sheet, brush with butter, and sprinkle lightly with salt. Cut into small crackers (vary the size as you like - I made mine about the size of Wheat Thins), and then prick each cracker once or twice with a fork. Separate the crackers so that there's a little bit of space between each cracker. Repeat until the baking sheet is filled. Bake 10-15 minutes, until the crackers are lightly browned, rotating the tray halfway through. Keep an eye on the crackers since they will cook at a different rate depending on their exact thickness and size. 6. Repeat with the remaining dough until all the crackers are baked. 7. Once cooled, the crackers can be stored in an airtight container for up to a week. 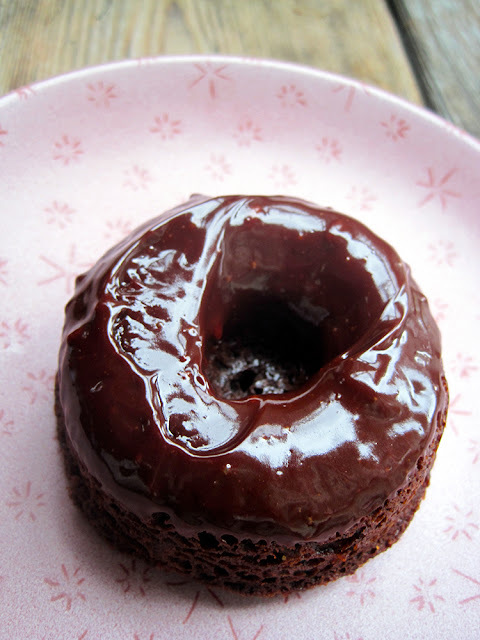 I recently won a mini doughnut pan from Wholesome Cook - thank you to Martyna for such a fun gift! For my inaugural doughnut-baking adventure, Tim requested chocolate doughnuts, and I found a fantastic recipe at Mama's Gotta Bake. These doughnuts taste a lot like brownies, except with a lighter texture. The flavor is rich and chocolate-y, and the ganache glaze really takes them over the top. We definitely could not stop at just one (or two)! These made a great indulgent brunch with scrambled eggs and fruit salad. The iced doughnuts will keep for a couple of days, covered...if they last that long! 1. Preheat the oven to 350 degrees and lightly grease the wells of a 12-doughnut mini doughnut pan (I used oil spray). 2. Whisk together the cocoa, flour, sugar, baking powder, espresso powder, baking soda, salt, and chocolate chips in a large bowl. Set aside. 3. In a medium bowl, whisk together the eggs, milk, vanilla, and vinegar. Add the wet ingredients to the dry and whisk in the butter. No need to beat - just make sure everything is combined. 4. Spoon the batter into the pan, dividing it as evenly as possible among the wells. 5. Bake about 10-12 minutes, until a tester comes out clean. 6. Remove doughnuts from oven and after about 30 seconds, turn out onto a rack. 7. Make the topping. Combine the chocolate chips and cream in a small saucepan and heat until melted. Mix to combine. Dip doughnuts into glaze and enjoy! You can dip warm doughnuts into the glaze if you're going to eat them right away; if you're saving the doughnuts for later, wait to dip until the doughnuts are completely cooled. My Secret Recipe Club partner for this month was Everyday Mom. Even though it's the new year and we're supposed to be virtuous, I decided to make a cake from her blog...and serve it for breakfast! I totally fell in love with the idea of this chocolate pear cake when I saw it on Everyday Mom, and then a plea for baking help came from my church's Sunday-morning cafe team. I decided to just go for it...the cake has fruit in it, so it can pass for coffee cake, right?! I baked a mini portion in a ramekin to make sure I would get to try the cake...we'll just call it quality control. :) I ended up subbing in apples for the pears, simply because that was what I had on hand, and it worked perfectly. 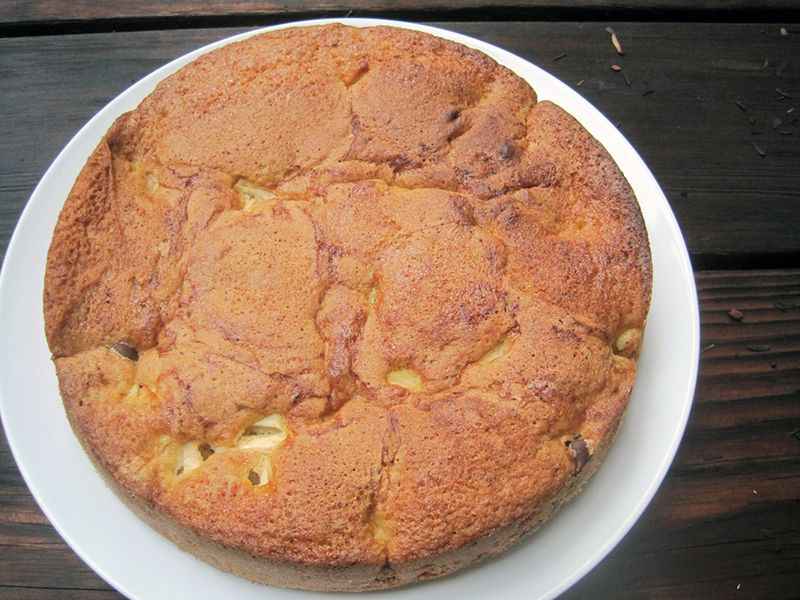 The cake is lightly sweet, and the chocolate and juicy bits of apple make it a delicious treat. The method of preparation makes for a light texture, but be careful not to over-beat the batter - I think I overdid mine a bit, which made it a little tough (but still tasty). This isn't so sweet or rich that you can't serve it as a coffee cake if you like, but it would also be great for dessert, perhaps with a little whipped cream. 1. Preheat the oven to 350. Grease and flour a 9-inch springform pan. 2. Sift together the flour, baking powder, and salt in a small bowl. Set aside. 3. Place the eggs in a stand mixer fitted with the whisk attachment. Whip on high speed for 8-10 minutes (yes, 8-10 minutes! ), until the eggs are pale and very thick. 4. Meanwhile, brown the butter in a medium saucepan or skillet. 5. Add the sugar to the eggs and whip for another couple of minutes. Beat in the flour and butter in alternating additions (flour-butter-flour-butter-flour), whipping the batter just enough to incorporate the ingredients. Gently fold everything together with a rubber spatula to make sure everything is fully incorporated. Be very careful not to overmix. 6. Scrape the batter into the prepared pan. Sprinkle the apples and chocolate chips over the batter, alternating between the two a couple of times. Bake 40-50 minutes, or until a tester comes out clean. I made these rolls for a big family gathering with help from my boyfriend and my 11-year-old cousin (she especially liked punching down the dough!). 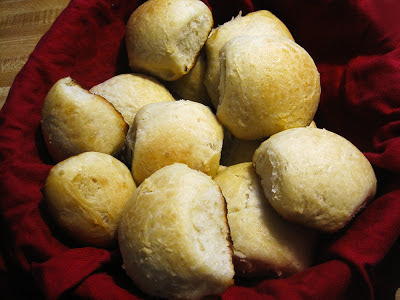 The recipe is somewhat of a time investment because the first rise is two hours, but the results are seriously worth it because these are some of the best dinner rolls I've made. The honey lends a subtle sweetness and the rolls are soft with a light texture. The butter-honey glaze on top is delicious, although the rolls didn't get as brown in the oven as I would have liked - next time, I'd bake these on the top rack in the oven and hopefully get more browning. Word of warning - the dough is pretty sticky, so make this with a stand mixer if you don't want sticky hands. 1. Whisk together the warm water and yeast. Let stand 10 minutes and make sure the yeast is bubbling (if not, start over with new yeast). 2. Add to the yeast mixture the egg, honey, oil, and salt. Whisk until well combined. Add 3 cups of flour and beat until a loose dough forms. If using a stand mixer, attach the dough hook and bean in the remaining flour 1/4 cup at a time. Or, do the same by hand using a rubber spatula and then your hands. Add enough flour to make a soft, somewhat sticky dough. Knead for a few minutes, until elastic and uniform in texture. 3. Spray a bowl with oil, and then place the dough in the bowl. Cover with plastic wrap and let rise in a warm area until doubled, 2 hours. 4. Punch down the dough and knead for a minute or so. Let rest 10 minutes. 5. Lightly grease a cookie sheet. Pull off small balls of dough and create surface tension on the surface by stretching the dough over itself, tucking it under, and pinching it off at the bottom of the ball. Place the dough balls on the prepared cookie sheet, almost but not quite touching. You can make the rolls larger or smaller depending on what you prefer - I made lots of small rolls. 6. Lightly cover the baking sheet with a clean kitchen towel and let rise for 30 minutes. 7. While the dough rises, place one of the oven racks on the top slot in the oven and preheat the oven to 400 degrees. 8. Mix together the melted butter and honey. If it's not liquid enough to easily spread onto the rolls, microwave for a few seconds to melt the honey more. Brush the honey-butter mixture over the risen rolls. Bake 12-15 minutes until the bottoms are browned and the rolls are cooked through. 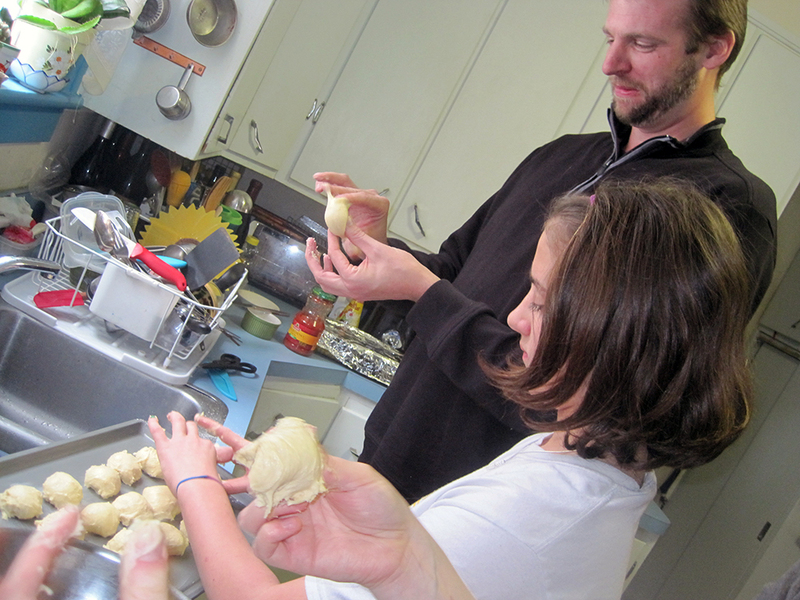 Tim and Mia working on the rolls. I've long loved Smitten Kitchen's blog, and I've enjoyed lots of her recipes, like Zucchini-Lemon-Goat Cheese Pizza and Chard-Sweet Potato Gratin. So, I was really excited to get Deb's new cookbook. Unlike some blogger cookbooks, this one is definitely not just a reprint of recipes from the blog - almost all the recipes are brand new, and they are seriously tempting! The first thing I made from the cookbook was this pounded-and-breaded fried chicken recipe - also a great first use for my new meat pounder! This is a much easier way to make fried chicken at home, since you don't need a crazy amount of oil and you don't have to worry about cooking the chicken through before the breading burns. It's dressed up with French flavors, although you can easily change up the breadcrumb flavoring if you like. Pounding the chicken makes it extra tender, and I was surprised at how moist it turned out - even though the piece of chicken was thin, it stayed super juicy. The breading is so flavorful - I've never tried Dijon mustard as part of a breadcrumb coating, and it works really well. Don't skip the squeeze of lemon juice on top - the acid is really necessary to bring all the flavors together. I served the chicken alongside crispy, creamy fennel gratin - one of my boyfriend's favorites! 1. 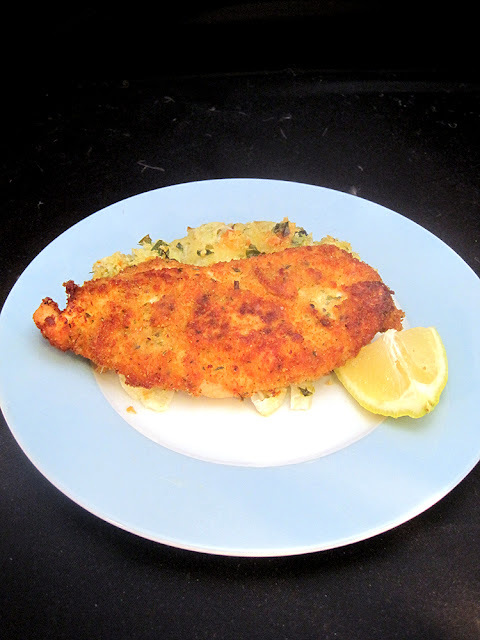 Slice each chicken breast in half, butterfly-style, so that you have six thin cutlets of chicken. Use a meat pounder to pound the chicken to about 1/4-inch thick. Season with salt and pepper. 2. Line up three large plates on the counter. Place the flour on the first. In a small bowl, whisk together the egg whites, Dijon, oregano, garlic powder, Aleppo pepper, and lemon zest. Pour half onto the second plate, and reserve the rest. Finally, pour the breadcrumbs onto the final plate. 4. Heat two large non-stick skillets over medium-high heat. Fill each with about half an inch of oil - a mix of vegetable and olive oil. When it's hot - i.e. when a drop of water sizzles nicely - very carefully add the chicken, three pieces per skillet. Cook 3-4 minutes on the first side and then carefully flip and cook 2-3 minutes on the second side. The chicken should be golden brown. 5. Line a large plate with paper towels. When the chicken is cooked, transfer it to the plate. Cover with another layer of paper towels and blot away any excess oil. 6. Serve the chicken with a squeeze of lemon. These were another attempt from the Bouchon Bakery cookbook, and since they're Christmas colors, I figured I'd better post them soon! These were not the best oatmeal cookies I've ever had - I like them a bit thicker, and these cookies spread a lot in the oven - but they were definitely very tasty. They stayed chewy for a long time, and the vanilla flavor came through really well, which you don't always get in cookies. 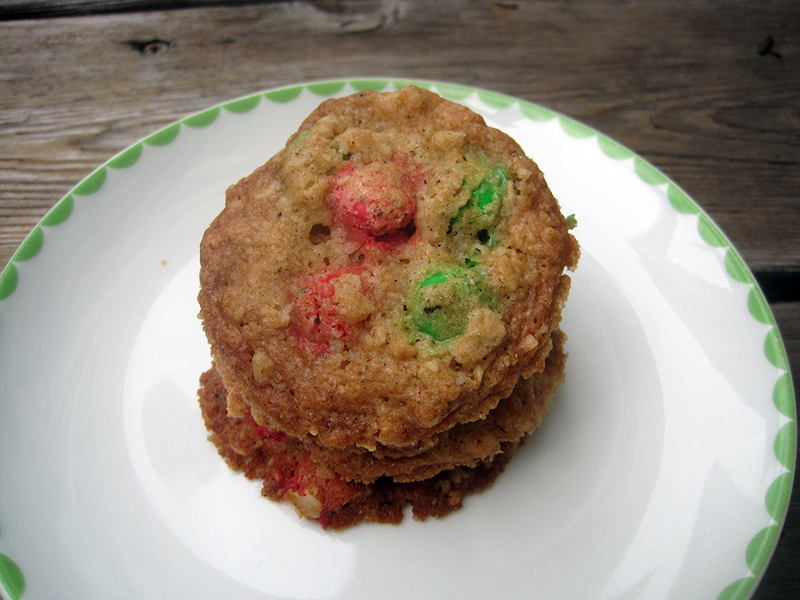 Plus, of course, any cookie with M&Ms is going to be awesome. :) Sorry about all the weird measurements below...the cookbook gives all the measurements in two or three different ways, and so I just went with what I used so I wouldn't give measurements I didn't actually try! 1. Preheat the oven to 325 degrees and line a baking sheet with a Silpat or parchment. 2. Whisk together the flour and baking soda in a small bowl and set aside. 2. Beat the butter in a stand mixer until it's the texture of mayonnaise. Beat in both sugars for 3-4 minutes, until light and fluffy. Beat in the vanilla for about 30 seconds, and then beat in the egg on low speed until just combined. 3. Beat in the flour mixture in two additions, until just combined. Briefly beat in the oats, and then stir in the M&Ms by hand. 4. Chill in the fridge for at least 2 hours. 5. Scoop spoonfuls of the dough onto the baking sheet, leaving a good amount of space between. Bake about 10 minutes, until golden brown and set on top. Cool on a wire rack.